The HST science operations depend upon a healthy, reliable and efficient spacecraft. HST hardware subsystems have significant redundancy. However, hardware failures may reduce or eliminate redundancy to the point where additional failure can lead to the loss of function and ultimately to the loss of the science mission. Maintaining HST spacecraft health and safety is the highest priority task for the HST Program. Spacecraft subsystem performance is continually monitored. One of the tools used to forecast HST spacecraft health is the HST Reliability Model. This tool is extremely useful in planning servicing mission strategies, payload content and priorities. This model has been reviewed and validated by the HST Independent Review Team. The Aerospace Corporation developed and maintains the HST Reliability Model for the HST Program. It encompasses all the spacecraft subsystems with the exception of the scientific instruments. The model takes into account hardware redundancies and the regularly updated box-level failure rates. The HST Reliability Model is described in the Aerospace Corporation report, "Hubble Space Telescope Reliability Assessment, July 2002 Model," Aerospace Report No. TOR-2003(2154)-2352, dated November 21, 2002, which will be made available upon request. It should be noted that the modeling of gyroscope failure probabilities is statistically stronger than has been possible for other spacecraft components. It is based on the performance histories, both in ground testing and in flight, of over 90 similar gyroscopes across many programs. The gyroscope analysis includes both random failures and physical wear-out, as represented by a Weibull function. The most recent HST Reliability Model results are as follows. Prior to SM4, the model indicates that the reliability of the HST gyroscopes dominate overall system reliability. Three gyroscopes are required to perform HST science operations. Of the six gyroscopes on board HST, four are currently functional (Gyroscopes 1, 2, 4, and 6) and two have failed (Gyroscopes 3 and 5). Following the failure of Gyroscope #3 in late April 2003, Aerospace recalculated the probability of 3 functional gyroscopes versus time from a time reference beginning July 1, 2003. The results are shown in the Figure 1. Given the current SM4 launch date baseline of May 5, 2005, the probability of 3 or more functional gyroscopes up through SM4 is approximately 70 percent. However, the probability of 3 functional gyroscopes decreases rapidly for a launch date after May 2005. As can be seen in the figure, the probability of 3 functional gyroscopes is approximately 50 percent as of December 1, 2005, and only 30 percent as of July 1, 2006. The HST Program models overall spacecraft subsystem reliability as a function of time. The reliability predictions are recalculated based upon the successful completion of a servicing mission. The model is updated with the assumption that full redundancy will be restored to the HST spacecraft hardware during Servicing Mission 4, e.g., 6 functional gyroscopes are restored. The reliability projections are a function of time elapsed following a servicing mission, and thus are independent of a specific launch date. The overall system-level curve, shown in Figure 2, is constructed from the product of the values of reliability versus time for 51 individual subsystems. The gyroscopes comprise only one element of this calculation. The model forecasts that 5 years after Servicing Mission 4, the HST system-level probability for continued science operations is 30 percent. Thus, given the current launch date baseline of May 5, 2005, the formal probability of continuous science operations through May 2010 is 30 percent. Further, the likelihood of continuous science operations through May 2011 is formally only 18 percent. However, the situation may not be quite so dire. The model predictions are conservative in two ways. First, an individual part failure is assumed to cause loss of function for the hardware component modeled. Components may still function at some level in spite of a single part failure. Secondly, loss of hardware functionality may be mitigated by workarounds, e.g., added flight software functionality to overcome the hardware problem. It is simply not possible in advance of a failure to evaluate how overly-pessimistic the model predictions might be. It is of interest to consider the historical record of the durations between Hubble servicing missions, vis a vis cessation of science operations. Only one episode of cessation of science operations has occurred, for approximately six weeks prior to the launch of SM3A, due to gyroscope failures. Currently the Pointing Control System requires 3 working gyroscopes. Less than 3 gyroscopes leads to HST entering "Zero-Gyro Safemode", as happened just before SM3A. The HST Program is actively planning the potential implementation of a 2-gyro mode for science operations, that would enable continued science operations, with some loss or degradation of observing capabilities, for approximately 12 to 15 additional months. 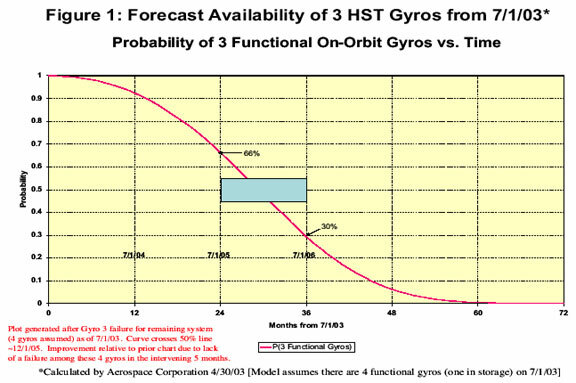 The HST Reliability Model prediction shown in Figure 2 is a generic, "Time since last Servicing Mission," curve that assumes full spacecraft redundancy has been restored as an outcome of the servicing mission. The prediction is applicable not only to SM4 but also to any Servicing Mission beyond SM4. Hubble's scientific instruments are each designed for a five-year operational lifetime in orbit. Historically, they have lasted considerably longer than that. Only one instrument, the Goddard High Resolution Spectrograph (GHRS), has suffered an electrical or mechanical failure that left it completely inoperable. That failure occurred in 1997, just a few weeks before the GHRS was to be removed from Hubble during the second servicing mission. The GHRS was one of the original five instruments launched on Hubble in April 1990. After about two years of operation, GHRS lost a portion of its observing capabilities, but a simple repair by the astronauts restored these during Servicing Mission 1 (SM1) in 1993. The Near Infrared Camera and Multi-Object Spectrometer (NICMOS) was originally designed to be cooled by a block of solid nitrogen ice, with an expected lifetime of about four years. A thermal short in the instrument reduced its "first life" to about 22 months. However, during Servicing Mission 3B (SM3B) in March 2002, astronauts installed a newly designed mechanical cooling system and the instrument's science operations were resumed (with a 30-50% improvement in sensitivity). The Space Telescope Imaging Spectrograph was launched along with NICMOS in Servicing Mission 2 (SM2), February 1997. In the summer of 2001 Side 1 of STIS' electronics failed irretrievably and it is currently operating on its redundant Side 2. Thus, even with a significant electronics failure, STIS continues to operate nearly two years beyond its design lifetime. The current record holder for longevity among HST instruments is the Wide Field and Planetary Camera 2 (WFPC2), which has operated without significant failures for nearly ten years, since its launch in December 2003. Scientifically, it has been superseded by the Advanced Camera for Surveys (ACS) and will be replaced by Wide Field Camera 3 (WFC3) during Servicing Mission 4 (SM4) in 2005. At the conclusion of SM4, Hubble's complement of scientific instruments will consist of two spectrographs and three cameras (as well as a Fine Guidance Sensor useful for astrometry). Although there is some overlap of function, as a general rule these instruments are complementary to each other in their designs. The new Cosmic Origins Spectrograph (COS) provides some backup to STIS. However, it does not replicate STIS' capabilities for long-slit imaging spectroscopy, needed for the detection of massive black holes in galactic nuclei, nor for very high-resolution spectroscopy required for measurements of chemical abundances in the interstellar gas, for example. The COS is purely an ultraviolet spectrograph and does not provide a backup to STIS' coverage from 300 to 1000 nm. The new WFC3 will supplant NICMOS for most near-infrared imaging, and will complement ACS by providing Hubble's first wide field, high sensitivity imaging capability at near-ultraviolet wavelengths. The WFC3 provides some backup to ACS for visible light imaging, but is not as sensitive as ACS at the red wavelengths of interest for studies of galaxy evolution. The lifetimes of WFC3 and COS should extend to 2010. Thus, in 2010 we would expect Hubble still to have powerful instrumentation both for ultraviolet spectroscopy to very deep levels of sensitivity and for high-resolution, wide-field imaging spanning the range 200 � 1700 nm. The ACS will be about two years beyond its design lifetime in 2010, but can reasonably be expected still to be in operation. Its CCD detectors will have suffered significant levels of degradation in both charge-transfer efficiency and growth of the population of unusable "hot pixels" to about 6%. However, these signs of "aging" potentially affect only a sub-set of ACS science and there likely will be operational approaches to mitigating them. Mechanical cooling systems such as the one now cooling NICMOS have demonstrated lifetimes of over a decade in ground testing. The lifelimiting element for NICMOS is likely to be the Power Conversion Electronics for the cryocooler that provides power to the microturbines. This subsystem is expected to have a 9% probability of failure after five years of operation. The near-infrared channel of WFC3 will supplant most of NICMOS' science capabilities. We have no way of predicting STIS' longevity, as it operates on its remaining redundant electronics. It could fail tomorrow, or it could last many additional years. HST science lifetime could potentially be limited by HST spacecraft orbital decay. Long-term orbit decay predictions are developed based on atmospheric models and solar flux predictions. All contributing combinations of solar flux strength and timing are run in order to bound the orbit decay predictions from a best case atmosphere to a worst case ("unkind") atmosphere. The predictions also consider the effects of Space Shuttle re-boost during HST Servicing Missions. Figure 3 shows the model results for a worst case, 2-sigma high solar cycle (Cycle 24), followed by an early Cycle 25 of average intensity. Figure 3 depicts four curves for various shuttle re-boost scenarios. 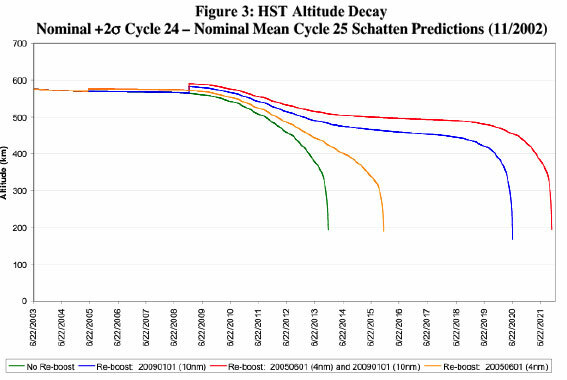 For the case of no further HST re-boost in any future servicing mission, the prediction is that HST will reenter the Earth's atmosphere in late 2013 or early 2014. The HST science program will cease approximately one year prior to re-entry due to loss of the precise attitude control capability required for science observing, as the atmospheric drag increases. The earliest expected end of the HST science program due to orbital decay is thus late 2012. Further information about this topic is contained in the accompanying Hubble Fact Sheet, entitled "HST Orbit Decay and Shuttle Re-boost." Degradation of the HST primary optics could potentially degrade the scientific performance of the observatory. Contaminants on the primary or secondary mirror, or physical degradation of the mirror surfaces can result in loss of sensitivity or changes in the properties of stellar or other point-source images. To date, there is no evidence of any loss of throughput of the telescope at the level of uncertainty of the measurements (3- 5%), nor is there any evidence of changes in the point spread function over many years, resulting, for example, from increased wide-angle scattering due to pitting of the mirror surfaces. More details are contained in the accompanying Hubble Fact Sheet, entitled "Degradation of Primary Optics." HST science lifetime is limited by the four factors described above. The health of the HST spacecraft is of most importance in achieving continued science operations through 2010. Even with the servicing of HST in SM4, the goal of meeting science operations through 2010 will likely fall short. In considering science operations beyond 2010, spacecraft health continues to be a major factor, and potentially orbital decay can affect the longevity of HST science. To overcome this, a Servicing Mission in the 2009 to 2010 timeframe that includes a re-boost activity would be required. With such a servicing mission, the HST science lifetime could be expected to continue into the 2014 to 2015 timeframe.